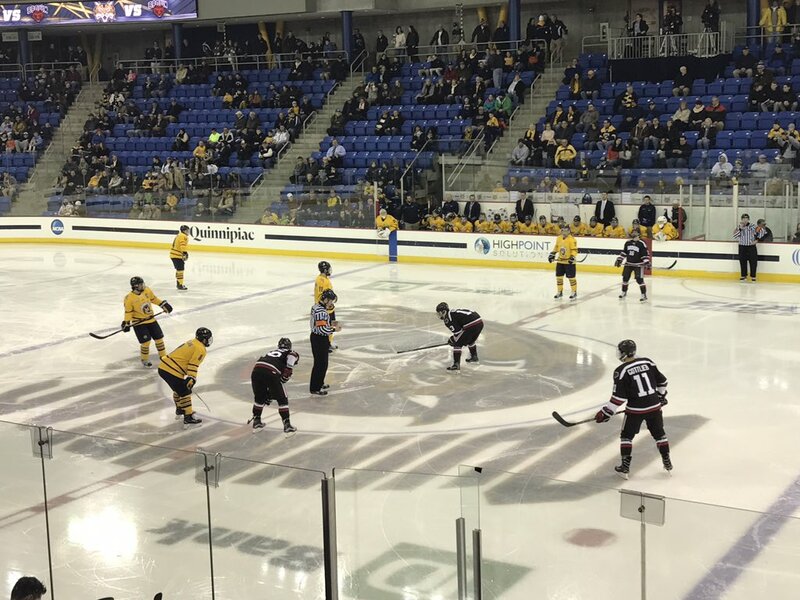 The BobcatsHockeyBlog has pieced together the 2017-2018 Quinnipiac University men's ice hockey schedule through the composite ECAC schedule release, non conference opponents releasing their schedule, leaks from other college programs and sources in the college hockey game. 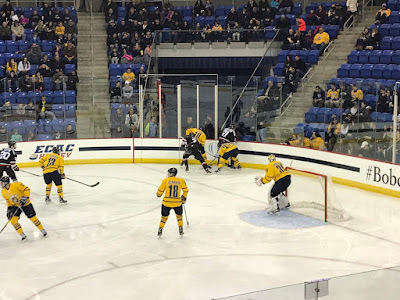 Rand Pecknold's squad has a difficult six game stretch to open the season with five Hockey East teams including perennial powers Boston College and Boston University in its opening weekend. 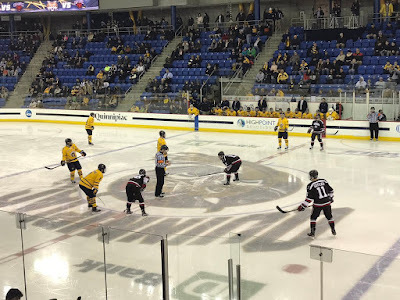 Some of the other first half season highlights include the Bobcats opening ECAC play with Cornell on November 3rd at the TD Bank Sports Center. The Battle of Whitney takes place on Saturday November 18th which is the earliest Yale home game since the season after the program reached its first Frozen Four back in 2013. Over Thanksgiving break the Bobcats will see newly minted first round draft pick Cale Makar and his UMass Minuteman in an I-91 series with each team having a home game. They wrap up the first semester with four home games in a row capping it with a non league pair against Maine. The second half of the season begins with eight straight games away from Hamden highlighted with a trip to the desert for a pair of games with Arizona State. Quinnipiac will head to Ingalls Rink on Friday February 9th to face Yale. Here is the full schedule below. Five Quinnipiac Bobcats hockey players are set to attend NHL development camps currently or in the coming weeks. The five players attending will be junior captain Chase Priskie (Washington Capitals), sophomore defenseman Karlis Cukste (San Joe Sharks), sophomore goaltender Andrew Shortridge (Nashville Predators), sophomore defenseman Brogan Rafferty (Chicago Blackhawks) and incoming freshman goaltender Keith Petruzzelli (Detroit Red Wings). Priskie, the newly selected captain was drafted by the Capitals in the sixth round of the 2016 draft after a spectacular rookie campaign. He followed that up with a 26 point sophomore season (7 goals, 16 assists) while achieving All-ECAC Third Team honors. He will look to lead a talented Quinnipiac team back to the NCAA tournament after missing for the first time in five seasons. The Capitals camp runs from June 27 to July 1. Cukste had a very solid rookie campaign on the defensive end with 10 points (5 goals, 5 assists) while blocking a team leading 65 shots. A 5th round draft pick of the San Jose Sharks in 2015, Cukste continued to improve throughout the season and should be someone that could provide increased offensive ability this season. This past December he was part of the Latvian national team at the World Junior Championships in Canada. He will attend the Sharks camp from July 8 to July 12. Shortridge was a big reason the Bobcats had a very good second half of the season in the 2016-17 campaign. He grabbed the goaltender reigns early in the second semester and never let go, showcasing his talent in college hockey and opening the door to possible future professional opportunities. Shortridge finished the season with a 13-7 record along with a 2.08 goals against average and a .920 save percentage. He was even stronger in league games going 7-2 with a 1.74 goals against average and a .934 save percentage. Shortridge won two postseason series against Brown and St. Lawrence before the team fell in the semifinals to eventual ECAC champion Harvard. He will attend the Nashville Predators camp from June 26 to June 30. Rafferty had a very good offensive season for the Bobcats leading the team with 22 assists to go along with two goals. He became the first Quinnipiac freshman to lead the team in assists since Matthew Peca in 2010-11 season. He had NHL interest this past season so it is no surprise he is heading to an NHL development camp and will be looked upon to increase his production further. The Blackhawks camp runs from July 17 to July 21. Petruzzelli recently drafted by the Detroit Red Wings with the 88th pick in the third round is the highest incoming freshman draft pick in Quinnipiac history. He comes to the program with a lot of hype and excitement after a tremendous rookie season with the Muskegon Lumberjacks of the USHL. He posted a 22-10-0-1 record with a 2.40 goals against average and a .918 save percentage. His 22 wins were first among rookie goaltenders in the USHL. His play earned his All-USHL Rookie Team honors. He was the Most Valuable Player of the USHL/NHL Top Prospects Game when he made 21 saves in a 27 minutes of action. He was also a member of the silver medal winning United States team at the 2016 Ivan Hlinka Memorial Tournament. The Red Wings camp will be held from July 7 to July 11. Keith Petruzzelli has been selected 88th overall by the Detroit Red Wings. The 6-foot-6, 180 pound Petruzzelli, a native of Wilbraham, Massachusetts is the highest incoming draft pick in the history of the Quinnipiac Bobcats program. Former standout defenseman Devon Toews was previously the highest selected Bobcat when he was selected in the 4th round by the New York Islanders in the 2014 NHL Entry Draft. Transfer John Doherty was a second round pick by Toronto but went to New Hampshire for two years before coming to Quinnipiac. 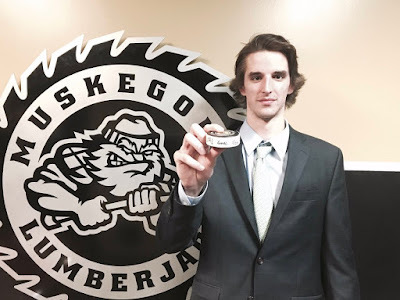 Petruzzelli recently concluded his first and only season with the Muskegon Lumberjacks of the USHL where he led all rookie goaltenders with 22 wins and had a .918 save percentage. Prior to playing with Muskegon, he was a standout at the South Kent School in Connecticut going 21-1 with a 1.13 goals against average and a .936 save percentage with nine shutouts in 22 games played. Petruzzelli will compete with rising sophomore Andrew Shortridge and senior Chris Truehl for starts in goal. He will be joined in Hamden with his brother D.J. who has battled some injuries the past couple of seasons in junior hockey. Petruzzelli is set to enroll for summer classes in July and take part in the summer workout program in preparation for the upcoming season.